One would indeed instinctively think that whilst the relatively weak single bond (about which rotation is easily possible) might be bendable, it seems less intuitive to imagine that something as apparently strong as a quadruple bond could be so. What might the measurable consequences be? Well, Girolami et al 16 years later (DOI: 10.1021/om00017a023) pointed out that such compounds exhibit restricted rotation about the Cr-CH2 bonds in the system, with quite significant barriers. This, it was felt, was due to an agostic CH…Cr interaction, which might in turn have induced bending of the Cr-Cr bond itself. There the story sort of peters out; no-one else has discussed bent quadruple bonds, or indeed exactly how bent they actually are. Well, another 16 years has passed, and now we have a rather better set of tools with which to answer such questions, yes you guessed (if you have read my earlier posts), AIM and ELF. Lets start with AIM, shown below (B3LYP/6-311G(d) calculation, for a somewhat reduced model compared to the real system). The bond critical point labelled 1 is the Cr-Cr interaction. It has a ρ(r) of 0.142, really very modest for a purportedly quadruple bond. The ∇2ρ(r) is +0.39, which is the wrong sign for a simple covalent bond, and indeed matches the criteria for the (homonuclear) charge shift category popularized by Shaik and Hibberty. 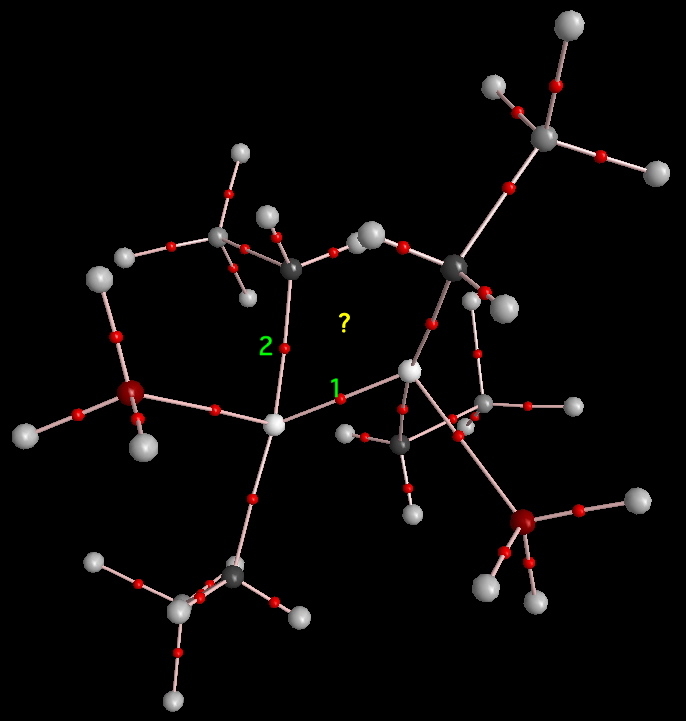 Point 2 is the Cr-CH2(si) bond (of calculated length 2.157Å), ρ(r) 0.078 and with an ellipticity ε of 0.34. This latter value compares to e.g. a value of 0.0 expected for a single (rotatable) bond and ~0.4 for a double bond, and seems to match very well with the observation of restricted rotation about this bond. So far, so good! Surprising however is the absence of any BCP in the region marked with a ?, given that the Cr-C length in this region is 2.257Å (only slightly longer than than that for point 2 and surely a good candidate for some sort of Cr-C bond!). There is no sign of any bending of the Cr-Cr bond in this type of analysis (i.e. point 1 lies along the Cr-Cr axis), or indeed of any evidence for α CH…Cr agostic bonding. Time then for ELF (below). Well, in one regard, a similar picture to the earlier AIM is obtained. Points 1 and 2 sort of match, and again, no point is found in the region marked with a ?. However, there the similarities end. Thus, point 1 (the apparent quadruple bond) integrates to only 1.04 electrons! But wait for it, it lies well off the straight line connecting the two chromium atoms. Wow! So the bond really is bent! And, because it is contains only 1.04 electrons, that might explain why it can bend so easily! Well, if the Cr-Cr bond does not contain the electrons, where have they gone? 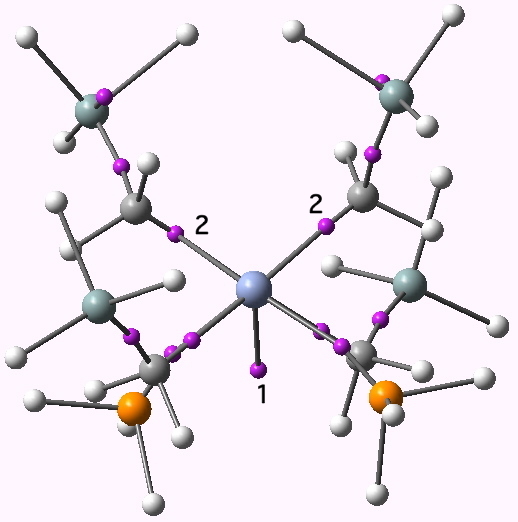 The mystery is solved when point 2 is inspected (there are of course two of them, the molecule having C2 symmetry). These each correspond to 1.92 electrons. The ELF analysis furthermore tells us that point 2 is actually trisynaptic, covering both chromium atoms and the carbon. 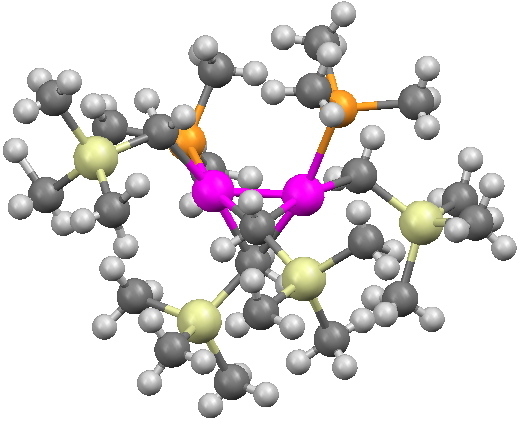 We have found 4.88 electrons associated with the Cr-Cr bond after all (and this is not bad, since one rarely finds the full quota directly in such regions using ELF). 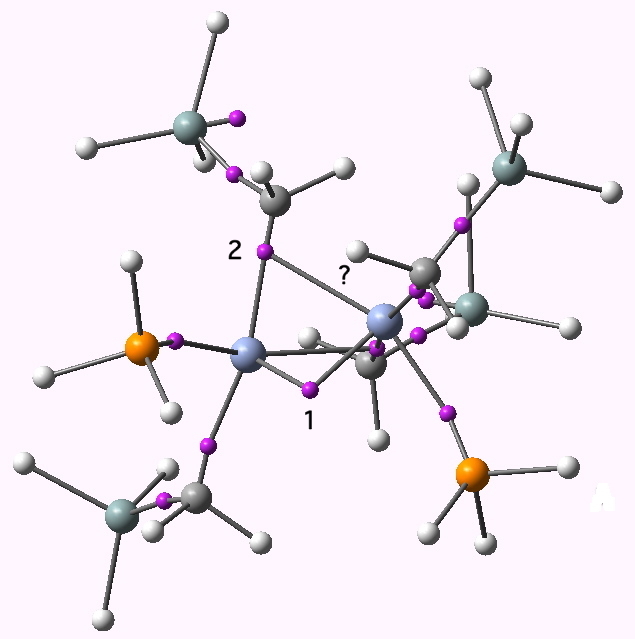 To indicate this, point 2 above is actually shown connected to three atoms. So to summarise, our Cr-Cr quadruple bond in the ELF analysis occupies three different synaptic basins, arranged in a triangle around the C-Cr axis (as shown below), and with the straight line between the Cr-Cr not entertaining any basin. That certainly is bent! ELF of course gives only one interpretation of the bonding; there are others. But this interpretation certainly seems to give an interesting and unusual insight into this remarkable (and largely ignored) phenomenon. This entry was posted on Saturday, January 23rd, 2010 at 7:37 pm and is filed under Hypervalency, Interesting chemistry. You can follow any responses to this entry through the RSS 2.0 feed. You can leave a response, or trackback from your own site.